Early day travelers used the clearing west of this sign as a stop-over and resting place during their journeys from Lost Prairie, Flora, Paradise and other points north to Elgin. Travel was by saddle horse, stagecoach, or wagon. 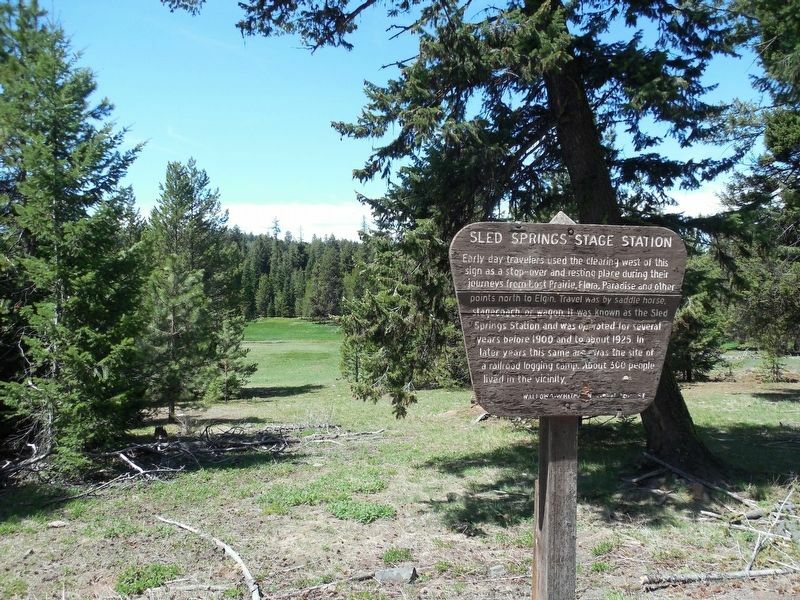 It was known as the Sled Springs Station and was operated for several years before 1900 and to about 1925. In later years this same area was the site of a railroad logging camp. About 300 people lived in the vicinity. Erected by Wallowa-Whitman National Forest. Location. 45° 43.453′ N, 117° 16.284′ W. Marker is near Enterprise, Oregon, in Wallowa County. Marker is on Oregon Route 3, on the right when traveling south. Touch for map. Marker is in this post office area: Enterprise OR 97828, United States of America. Touch for directions. Regarding Sled Springs Stage Station. 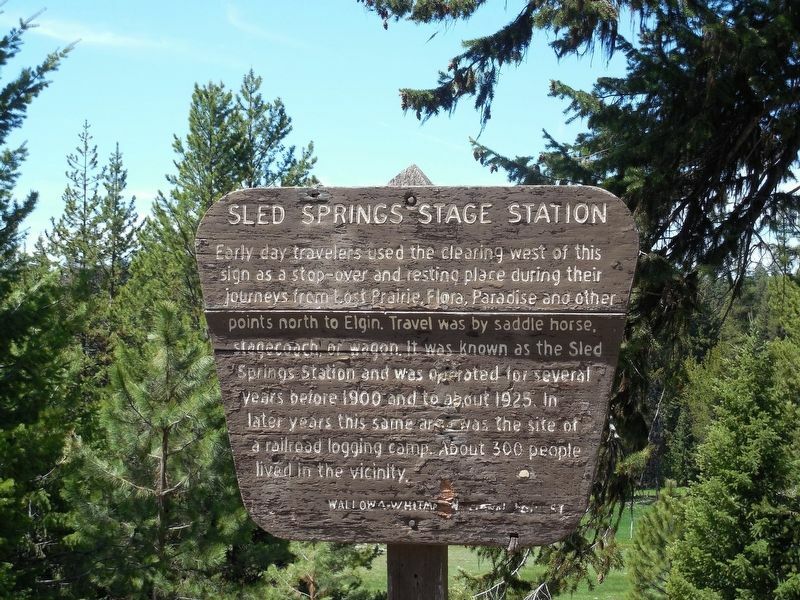 Historical marker - former stage station in northeastern Oregon. More. Search the internet for Sled Springs Stage Station. Credits. This page was last revised on May 11, 2017. This page originally submitted on May 11, 2017, by Doreen Thomson of Calgary, Alberta Canada. This page has been viewed 148 times since then and 7 times this year. Photos: 1, 2. submitted on May 11, 2017, by Doreen Thomson of Calgary, Alberta Canada. • Bill Pfingsten was the editor who published this page.